Millions of people worldwide rely on orthotics, prosthetics, wheelchairs and other assistive devices to improve their quality of life. In the United States alone, there are more than 1.6 million people with limb amputations. The World Health Organization estimates the number of wheelchair users to be about 65 million people worldwide. It is important to improve the daily lives of people with disabilities or physical weaknesses, and allow them to be more independent. Unfortunately, current assistive technology does not fully address their needs. Wheelchairs cannot climb stairs; arm prostheses do not enable versatile hand functions. Powered support devices have limited battery life. The list goes on and on. Many people need help climbing stairs. Credit: ETH Zurich/Alessandro Della Bella. People with disabilities are often disappointed with their devices’ performance, and choose not to use them. The main objection is that designs ignore user needs, such as individual preferences for device appearance, sizing and fitting for comfort and function, effort and time required to put on and take off, and device durability and weight. Beyond the design issues, these tools are expensive. Cost shuts many people out of using them, regardless of how well they work.“ And stairs, steep ramps, narrow doorways and low tables can make the use of assistive technologies very cumbersome or even impossible. It is an industry ripe for innovation. To encourage this work, I have founded a new kind of competition promoting the development of useful technologies. In the Paralympics, parathletes aim to achieve maximum performance in sporting challenges. 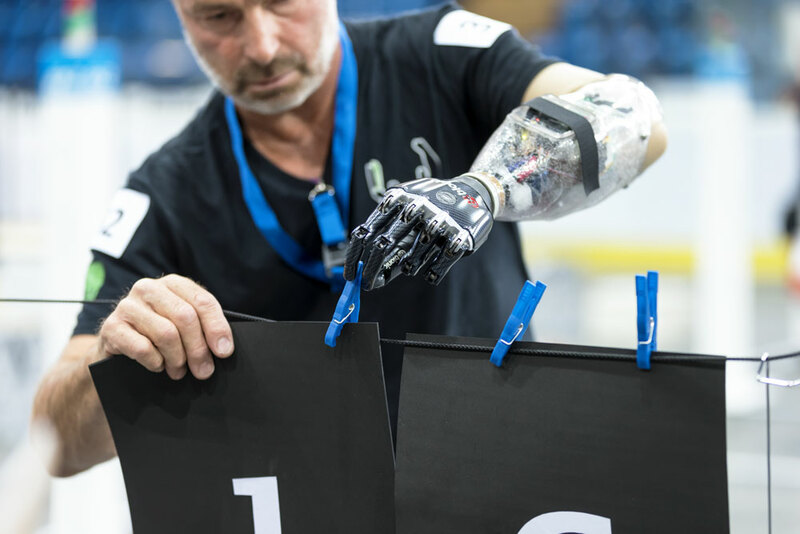 In our new contest, the Cybathlon, people with physical disabilities will compete against each other at tasks of daily life, with the aid of advanced assistive devices – including robotic ones. In the Cybathlon, what’s being tested is not just the abilities of human athletes, nor only the equipment they use. Rather, it’s their symbiosis, balancing good technical performance of the device, and its control by the athlete. Competitors will face off in six disciplines, for people with either limb amputations or limb paralysis of varying degrees, such as occurs after a spinal cord injury. We’ll organize a race focused on each of these technologies: powered leg prostheses, powered arm prostheses, functional electrical stimulation (FES) driven bikes, powered wheelchairs, and powered exoskeletons. The sixth competition is a racing game with virtual avatars controlled by brain-computer interfaces. Teams work together: a pilot in control, with others supporting and operating the technology. Credit: ETH Zurich/Alessandro Della Bella. We ran test sessions in July 2015, and have slated the full competition for October 8 in Zurich. The devices involved can be prototypes developed by research labs or companies, or commercially available products. Competitors will be called pilots, as they must control a device that enhances their mobility. 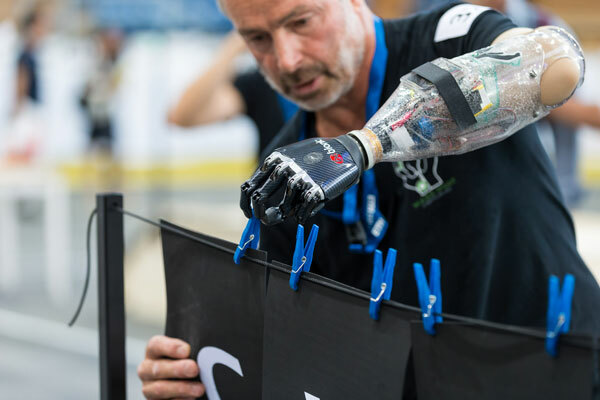 Competing teams each consist of a pilot, scientists and technology providers, making the Cybathlon also a competition among companies and research laboratories. As a result there are two awards for each competition’s winning team: a medal for the pilot and a cup for the company or lab that made the device. The competitions will simulate challenges people with disabilities face in daily life – situations that non-disabled people don’t think twice about but that can be insurmountable for others. Powered prosthetic legs Most leg prostheses require their users to swing the artificial leg just so, to properly align the knee, lower leg and foot. And they cannot transfer muscular power through the knee, using thigh muscles to help climb stairs, for example. One of the best unpowered-knee prostheses, offering a quite symmetrical gait compared to most devices. Powered leg prostheses can provide that missing power, but they are difficult to control unless the motor understands how the user wants to move. And even the best batteries are either too heavy or too short-lived to be a real solution. 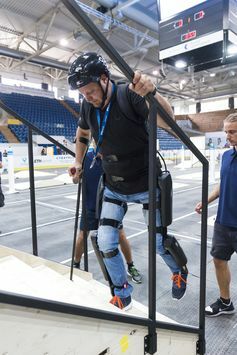 Our race will challenge pilots with above-knee amputations to use powered prosthetic legs to walk up and down stairs, stand up from a seated position, and otherwise navigate a complicated environment. Powered hands and arms Two-handed jobs, requiring either strength (like carrying a heavy box) or specific fine motor skills (like opening a small jar of jam) are challenging with even the best upper-arm prostheses. As a result, up to 60 percent of people with upper-limb amputation don’t use their prosthetic device very much or even at all. People are much less likely to reject more advanced devices, like body-powered or electric ones. Pilots with amputations at or above the lower arm will use motorized prosthetic hands and arms to complete various household and food preparation tasks. Assisted cycling People with complete paraplegia don’t lose their muscles; they just lose the ability to control them. A technology called functional electrical stimulation (FES) can restore some of this function, sending electricity into otherwise dormant nerves to activate muscles. FES technology has been used for decades. But the systems take a long time to set up, don’t produce much muscle force, and tire out muscles quickly. Surgically implanted systems give more specific control of particular muscles and higher force output. But they are expensive and invasive, and carry more risks than external FES devices that are merely strapped to a person’s body. For these reasons, doctors and patients don’t often use FES technology. In the Cybathlon, pilots with complete paraplegia will compete in a bike race, using FES devices to fire their leg muscles to drive the pedals. Helping cyclists pedal with functional electrical stimulation. Powered wheelchairs Despite the Americans with Disabilities Act and other laws and regulations, public buildings are still hard to enter and navigate in wheelchairs. Most outdoor devices are too bulky and not agile enough for indoor use; commercial indoor wheelchairs can’t travel over uneven terrain or steps. So-called intelligent or smart wheelchairs, which can autonomously navigate in known environments have been available for decades, but are very expensive and used by relatively few people. Wheelchairs are becoming more powerful, but often their control systems are neither as effective nor as comfortable as they could be. To push development of these functions, pilots with paralysis will take powered wheelchairs through an obstacle course with ramps, stairs, bends, doors and uneven terrain. Powered exoskeletons An alternative to wheelchairs are exoskeletal devices that help people walk. However, batteries only last a few hours, and the equipment is very bulky and heavy. Most of the commercially available multi-joint exoskeletons weigh between 46 and 62 pounds (21–28 kg). One device, called “REX” weighs nearly 88 pounds! Current commercial systems are so limited that they can’t even climb slopes or stairs. An obstacle course will test pilots’ and teams’ abilities to develop systems that can move through difficult areas. Navigating by brain power In the brain-computer interface (BCI) race, pilots with paralysis of all four limbs will control a virtual avatar in a racing game displayed on a computer screen. The best pilots will be able to make their brain signals emit three different commands to overcome three different kinds of virtual obstacles. BCI technology is becoming more popular, but most systems take a long time to set up, can be uncomfortable, and don’t function well outside the lab. That has prevented its broad use in daily life. Racing with brain power alone. The Cybathlon will bring together people with disabilities or physical weaknesses, researchers and developers, governments and other agencies that fund services and research. It will also showcase the importance of this work to the general public. Our hope is that over time, these devices will become more affordable and more functional. Unlike the Paralympic Games, pilots can use any technical aids they need, as long as they are safe. That enables people with more severe disabilities to compete. The goal is not to be the fastest or the strongest participant; rather it’s to be the most skilled pilot who can use advanced technologies to best overcome the challenges of everyday life.